This time of year, in the United States, we celebrate Thanksgiving, my favorite holiday. As always, I'm thankful for the myriad opportunities that have been afforded me during my crazy life filled with diversity. I'm thankful for the opportunity to write, speak, and play music with strangers and friends around the world. I'm finally beginning to realize that I've led a charmed life and I give thanks for that. My friend Kevin and I put together a little video on gratitude which seems especially appropriate on this Thanksgiving Day 2011. Hope you like it! 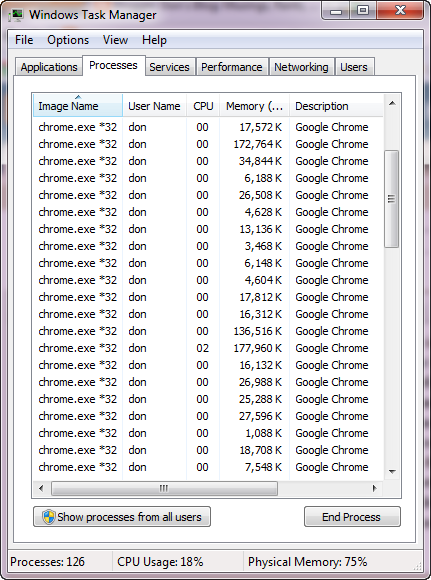 I added up total memory usage for Chrome and it comes to approximately 765810KB over 21 processes. 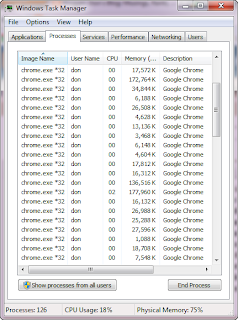 I realize, of course, that the screen cap of Task Manager represents a snapshot of memory usage at a particular point in time, but 21 processes for Chrome compared to one for Firefox? 137MB of memory usage for Firefox vs 765 for Chrome? Wow! By the way, the versions are 14.0.835.202 for Chrome and 7.0.1 for Firefox. Hmmm, it must require a lot of system resources for Chrome to keep phoning home to Google with all that data mining data. :) Looks like it's time to switch back to Firefox. Oh Firefox, do you still love me? Attentive listening: More accurately called "empathic listening", this is where you listen carefully to what the user is saying. Listen as though there will be a quiz at the end of the conversation. Don't plan your response or solution until the user is finished describing the problem. Gaining agreement: In this phase, you repeat back to the user your understanding of the problem so the user can confirm that you understand it correctly. Apologize, empathize, reassure: Apologize, if necessary, but don't do this frivolously and don't overdo it. Be authentic. If the problem is something caused by you or your department or a system for which you're responsible, an apology is in order. Otherwise, don't apologize. It comes off as shallow and insincere. You can certainly say you're sorry that the problem occured as a sign of empathy and/or sympathy. That makes sense and, in fact, is a great way of diffusing emotionally-charged situations with an upset user. You can use phrases such as, "I don't blame you for being upset. I'm sure I'd feel the same way if I were in your shoes." Do NOT say you understand how the user feels if you've never been in that situation and can't understand. (That's like a man telling a pregnant woman he understands how she feels. He doesn't and it's insulting to her intelligence to say something like that.) Remember, it's important to be authentic and sincere. Finally, reassure the user that you're going to take care of them and follow through to completion. You can say things like, "Based on what you've told me, I know how to take care of that." or "I've seen that problem before and was able to fix it quickly." I'll never forget a woman named Dixie at Sprint, who said, "Mr. Crawley, I'm gonna fix you up!" Problem solve: The final phase of the flow is where you actually fix the user's issue. It's important to note that phases one through four may go by pretty quickly or they may take some time, depending on the user and the nature of the call. As always, remember that everyone is unique with unique ways of dealing with the challenges that come up. Some people just want to get right to the problem, others want to talk for a moment. The non-technical aspect of our jobs as support providers is to develop a sensitivity to each user's unique set of needs and expectations. This flow is based on one described in my book, The Compassionate Geek. I would also consider adding a sixth phase to the flow and that's the confirmation of solution phase. In this phase, we make certain that we have solved the user's problem by simply asking, "Have I solved your problem?" This ensures that we really have taken care of the reason for their call and eliminates any chance that we missed something. An additional consideration is that, although the above flow is certainly valid, it's much too rigid for every case. That's why it's important to use good judgement in all situations. For example, the flow makes sense for a support session via telephone, but not for most support sessions via email. As with all interactions with end-users, remember to listen carefully and treat them with respect and dignity. When you do that, combined with a sense of empathy and compassion, you'll rarely go wrong. I just uploaded a new video in which I demonstrate how to configure a site-to-site VPN between two Cisco ASA security appliances. The demo is based on software version 8.3(1) and uses IPSec, ISAKMP, tunnel-groups, Diffie-Hellman groups, and an access-list. The demo is based on my book "The Accidental Administrator: Cisco ASA Security Appliance (Step-by-Step Configuration Guide) and includes a link where you can download a free copy of the configs and the network diagram. Thanks to blogger John Hazard for a great interview last week which is now available online. We talked about my new book The Compassionate Geek (co-written with Paul Senness) and the overall importance of people skills for technical people. I'm not sure what came over me. I'm insanely busy right now, but I decided to go ahead and upgrade the family computer to Ubuntu 11.04. I think my curiosity about the Unity desktop got the best of me. Anyway, I started the upgrade last night before going to bed. When I got up this morning, the computer was waiting for me to click through several prompts. After about another 30 minutes or so, it was done. After a reboot, I was rockin' with Ubuntu 11.04. I tried to enable rotating cubes and wobbly windows with Compiz and suddenly I lost the Unity bar and panel. Grrr. A quick Google search turned up this forum post: http://ubuntuforums.org/showthread.php?p=10734118#post10734118. Look for the post by mc4man for the solution. Well, there really isn't any way to ensure your organization is completely protected against phishing attacks. As long as people are involved in the process, there will be times when people fail to be vigilant and one of the bad guys reels someone in. You and I are probably more aware of what to watch for in phishing attacks, yet I've certainly come frighteningly close to clicking on a questionable link. I've been a fan of Michael Kassner for quite a while. He recently interviewed Roger Johnson, head of the Vulnerability Assessment Team at Argonne National Laboratory. They talked about the recent phishing attack at Oak Ridge National Laboratories. Hey, if a phishing attack can be successful there, it can happen to your organization. Check out the interview. My early excitement for smartphones was founded in a desire to cut down on stuff I was carrying. I loved the idea of a single, pocket-sized device that could serve as my phone, contact list, calendar, and music player. Oh, and it was important that it sync easily with my computer for the sake of simplicity. I'd been waiting for something practical to come along and finally took the plunge with a Treo 300, a clamshell device running PalmOS that, at least in theory, did it all. How limited was my imagination at that time! My new Android phone, of course, makes the Treo 300 seem like Eniac, by comparison. Blogger Bill Bulkeley wrote this story on AR for Cisco news. Now that more and more computers are shipping with 64-bit processors and 64-bit operating systems, just how important is it to have 64-bit applications? What are the benefits of 64-bit applications? I've been using an HP dv6661se laptop with an AMD 64-bit processor for four years. In the early days, there were quite a few frustrations such as finding hardware drivers and application compatibility issues. (There was one particular frustration with a lack of 64-bit drivers for my USB-to-serial adapter.) Today, the compatibility issues are much less of a challenge than they used to be, but what are some of the issues and benefits? Adobe Premiere CS5 only runs on a 64-bit system. I'm sure there are other apps out there that will only run in a 64-bit environment. This is almost exactly like the move from the 16-bit to the 32-bit world. I ran across this discussion at superuser.com that may be helpful. It's happened to all of us at one time or another. We've just met someone, he or she finds out that we work with computers, and those feared words come out, "Oh, you work with computers. Maybe you can help me." Many times we'd like to help, but we don't want to sit down and work on computers for free in our off time. We're happy to offer advice, but please don't ask us to sit down and look at a computer! Here are ten ways of responding to such requests. I was expecting spectacular explosions, a la Star Wars, so I was slightly disappointed by their absence. Regardless, this is pretty cool technology! This is the first successful use of the Navy's Marine Laser Demonstrator (MLD). It's a ship-mounted High Energy Laser, developed by the Office of Naval Research in cooperation with Northrup Grumman, which was fired at an unmanned motor boat. More info is here. I've known several police officers in my life. Even today, one of my best friends is a police officer. One of the things they've all said is that criminals, as a group, are pretty stupid, or at least make really stupid decisions. Otherwise, they wouldn't be criminals. Stories abound of dumb criminals doing dumb things and getting caught, but this article from Mental Floss really drives the point home. Those of us who enjoy technology love opportunities to use what we know, especially when it involves righting a wrong. Never underestimate the wrath and cunning of a geek crime victim! Buckle up for Patch Tuesday! Tomorrow is Microsoft's Patch Tuesday and this month, they're releasing 17 bulletins to fix 64 security vulnerabilities in Windows, Office, Internet Explorer, Visual Studio and .NET Framework. Nine of the bulletins have a security rating of critical, the rest have a rating of important, and they're all related to remote code execution. Seven of the bulletins require a restart. According to Fahmida Y. Rashid at eWeek, this massive update ties the record for the most bulletins released at one time. Wow! TechRepublic blogger Brien Posey recently published his list of Top 10 Windows security best practices. I love lists (like many people), so I reviewed his list and decided to share it with you. Even Linux/Unix admins can benefit from most of the items on the list. You'd think most of this stuff would be common sense, but if common sense was so common...(fill in your own list of stupid things people do). Setting up a VPN is about as common a task as there is in today's IT world. Problem is that proprietary VPNs such as Cisco's VPN solutions, although highly effective, can also be pretty expensive. When you're working in a budget-conscious environment or simply don't want to be tied to a particular vendor, you can consider implementing a VPN solution with OpenVPN. Author Vincent Danen has this how-to guide with all the steps. Although this post is not directly related to IT, we've all had to deal with workplace critics, those "nattering nabobs of negativisim" who, for political or personal reasons, cast a cloak of dread over new ideas, innovations, and the normal process of organizational evolution. This is not about thoughtful people genuinely offering constructive criticism. Art Perry, in his Management Excellence blog, recently wrote this great post on how to deal with those negative types in Leadership Caffeine: Coping with Workplace Critics. Coincidentally, my 26-year-old daughter, a middle-school teacher, recently had to deal with such an individual and, without having read Art's post, used several of his techniques. I'm still going to send it to her. For some time, Linux folks have upgraded the firmware on Linksys wireless routers to DD-WRT for the added functionality it brings. If you're not familiar with DD-WRT, it's a Linux based alternative OpenSource firmware suitable for a variety of WLAN routers and embedded systems. Here's a cool blog post by Ken Hess about how he connected his data center in his garage to his AT&T wireless modem using an old Linksys wireless router and DD-WRT. In addition to being a very interesting technical solution, it also demonstrates Ken's keen understanding of the importance of domestic tranquility! Microsoft has agreed to pay Nortel some $7.5 million for 666,624 IPv4 addresses. Now, blogger Bill St. Arnaud suggests that an IPv4 address could be worth $200. I don't doubt that might be true. What strikes me as funny, almost pathetic, is that ultimately the IPv4 address space will be worth nothing. Today, it wouldn't be worth much if only we, in the IT community would have completed the migration to IPv6 by now. Please don't flame me with all the cliche (but true) arguments about the complexity and challenges of a migration. I'm aware of all of that. Some of the migration challenges are beyond our control. For example, the last time I checked, Comcast was still not supporting IPv6 at my home. Many, perhaps most, consumer IP devices don't support it. At the enterprise level, many organizations have recently begun testing it, but the risks of any mass migration must be considered. Regardless, eventually we'll all have to move to IPv6, but until we do, we run the risk of having to spend hard-earned corporate and private dollars on currently-expensive/eventually-useless IPv4 addresses. Anyone want to bet on how soon IPv6 becomes the main transport protocol of the Internet? The tragedy of the earthquake in Japan and the resulting tsunami serve as stark reminders of the importance of disaster planning and preparedness. As IT people, we understand the importance of disaster preparedness, but how do you convince reluctant management to support it in the budget? The recent RSA breach, in which the SecureID algorithm was pilfered, is just another reminder to test and monitor your systems. Of course, it's impossible to protect every system against all attacks, but if your systems are compromised, you want to be able to demonstrate that you took reasonable precautions to ensure system integrity. I have a client who is currently going through PCI-compliance testing. This client is fairly sophisticated in terms of their understanding of IT, yet they were surprised at some of the vulnerabilities the compliance testing uncovered. Even if your organization doesn't accept credit cards, the PCI DSS compliance process provides a great way to test and harden your systems. PCI offers a free Self Assessment Questionnaire to help you get started. There's even more press for the ASA book. This time, it's at IT Knowledge Exchange. Not only did they do an interview, but they're doing a book giveaway as well. Check out their site and maybe you'll win a copy of my Cisco ASA book. The Ubuntu experiment continues to go well. It's mainly non-remarkable, which is the way you want it. The OS just seems to perform well. Last night I used RhythmBox to rip some songs from a CD and it worked much better and easier than Windows Media Player. It loaded very fast and all I had to do was click the link to copy songs to my computer. No complaints from the family and, in fact, they like things like the wobbly windows and rotating cube. So far, so good. Microsoft released Internet Explorer 9 on Monday. My fellow Computerworld blogger Richi Jennings has collected several comments from other bloggers about IE9. My issue is that I've become addicted to Mozilla Firefox and its many useful extensions such as Blank Canvas, Firebug, and Saved Password Editor. The problem Microsoft faces is that there's really no reason for me to switch from Firefox, so the fact that they came out with a new browser just makes me yawn. It's kind of like Bing. Bing appears to be an excellent search tool, but I'm very happy with Google. I'm so happy, in fact, that I don't feel an inclination to move away from it right now. At some point in the future, Google may mess up and do something stupid to drive me away (the history of business is littered with executives damaging or killing great companies by making bad decisions...I've done it a couple of times myself). If that happens, then there's an opportunity for someone else to move in and take over. Unfortunately for Microsoft, since Firefox is a global community project and not a project of a single individual or company, it's not likely to make the same missteps that a company might, so they may never have an opportunity to make a difference. Sure, I know MS has a huge market share, but that's based on their dominance of the desktop. Given the importance and growth of cloud computing, that dominance is likely to decrease and, with it, there goes the market share for IE. Inertia favors the incumbent. For me that's Firefox. I've recently written several posts about IPv6 including one titled You can't hide from IPv6 much longer and another one titled More on IPv6. The last IPv4 addresses were handed out in February of this year and the countdown is on. World IPv6 Day is June 8th, when major providers will be enabling IPv6 on their networks (many have already enabled it). You can test your IPv6 readiness at http://test-ipv6.com/, which is good for hours of entertainment. That same website has an entire page devoted to IPv6 day. Yes, conversion to a new transport protocol is challenging and potentially dangerous. Yes, it will happen eventually, so you might as well start the process of preparing now. See my previous posts for more information about the changeover process, including websites for more info about how to do it. My family has a computer in the kitchen which we use for looking things up on the Internet, playing music through Pandora, watching YouTube videos, and Facebooking. When guests come to the house, they'll often use it for checking email and many of the same things my family uses it for. It has been running Windows 7 for some time. A couple days ago, it started acting like it had a virus or had memory going bad. I mucked around with it for a while (sound familiar?) and wasn't able to fix it. I was growing increasingly frustrated (sound familiar? ), but then I had an idea. Considering what we use it for, why not just slap Ubuntu desktop on it? I could run the live CD version for a while, see how the family likes it, and if everything goes well, eventually install it on the HDD, replacing Windows. I ran into one snag with the video card drivers where the CD was spinning, but the screen was blank. I found a solution on journalxtra.com (thank you). So now, I've got Ubuntu 10.10 running on the kitchen computer. We'll see how the family likes it and I'll let you know what happens. There's been quite a bit of interest recently in my book The Accidental Administrator: Cisco ASA Security Appliance. The good folks at WebSpherePower just published a link to it and Network World posted an excerpt as a guest blog. Thanks to these great publishers and to my publicist Paul Krupin! Like many of the people who read this and other IT-oriented blogs, I've been keeping an eye on solid-state drive (SSD) technology for some time. It seems likely to eventually do to hard-disk storage what digital cameras did to film, but how well do you understand SSD today? What about security concerns such as encryption and drive-wiping? I ran across this blog post on Tech Republic which does an excellent job of introducing you to the basics of SSD storage and includes a good introduction to the security concerns associated with SSD. I hope it's helpful. A couple days ago in a previous blog post, I mentioned an AT&T white paper on IPv6. I also mentioned the importance of preparing now to migrate from IPv4 to IPv6, even if you don't see such a migration as imminent. Here's a link to Cisco's IPv6 documentation and here's where you'll find Microsoft's stuff on IPv6. Frankly, most of the IT people I know would prefer anything over calling tech support and only place such a call as a last resort after every other avenue has failed. In this case, the vendor's documentation failed and so did their technical support staff. In this blog post on my Computerworld blog, I share five tips for writing great technical documentation and include a link to a video with even more ways to improve your technical documentation. This is the year that we run out of IPv4 addresses. Many of my students have made signs of the cross and other similar reactions to the mention of IPv6, but it's coming. Just like most major transitions in our IT world, we can try to put things off, but eventually we migrate. Whether it's Windows 98 to Windows 2000, IPX/SPX to IPv4, or Ami Pro to Word (I know, I'm showing my age), eventually we migrate. That said, if you haven't started thinking about your migration process from IPv4 to IPv6, it's time. Here's a quote from a recently-released AT&T white paper on the subject, "For enterprises the transition to IPv6 will not happen overnight. The process takes thorough planning, preparation and execution. The number of “edges” and the depth of the network that must be IPv6–enabled will impact the complexity of the transition. Even a simple transition may take 6 months to implement." The paper, IPv6: Complete these five steps to prepare is an excellent starting point for you as you begin to think about your IPv4-IPv6 migration. It requires registration, but it's a good enough paper that I think it's worth it to recommend to you. What are your plans for migrating to IPv6? There are two kinds of wandering: wandering aimlessly and wandering with a purpose. Although it might seem like a contradiction in terms, wandering with a purpose is at the core of a 1980s management concept called Management by Wandering Around that has some serious benefits for IT staff. We don't normally associate the term "emo" with IT. In fact, emo is usually associated with a genre of emotionally-charged music listened to by unsmiling teenagers wearing lots of black. As IT pros, however, we sometimes have to deal with end-users who are under pressure to accomplish a task right when some component of IT/IS fails. Like the emo teenager, that end-user is probably not smiling and very much emotionally-charged. It's at times like that emotion and technology intersect. It's also at that moment when our emotional intelligence skills can make the difference between a successful outcome or a disaster. Can a water cooler kill your career? Possibly. The office water cooler, hallways, and coffee machine are places where either your advocates congregate or where detractors launch career-sinking torpedoes. These are the places where your colleagues in the office (superiors, peers, and subordinates) talk about you behind your back. Your colleagues can be your advocates or your detractors, depending on how they feel about you. Is that a router on your pallette (or are you just trying to ping me)? Note to the reader: I've been asked to be a regular blogger at Computerworld. My Computerworld blog, titled "From Tech to Exec" will be about the human side of IT. My plan is to continue this blog and include links to the posts on the Computerworld site as well as musings, rants, and how-to guides on things IT. In other words, this blog isn't going to change much, except that once per week, there will be a short teaser with a link to the Computerworld blog. What follows is that teaser. Our jobs, although technical by definition, are really about how we solve human problems in the workplace. The art of our work lies in how we develop creative, technical solutions to workplace challenges. We're artists and, instead of paints or clay, our palettes consist of code, scripts, cables, servers, and routers. Oh, and an ability to communicate in meaningful ways with our users. This blog is about the human side of technologists' jobs. Read more at Computerworld.